Canadian geoscience lost a loyal friend when Jérôme (Jerry) H. Rémick III passed away in his Québec City apartment on March 1, 2005. He was 76 years old. Jerry was an ardent admirer and supporter of the Geological Association of Canada for all his adult life. He spent his professional career with the Ministère des Ressources naturelles, Québec, where he was a diligent and respected geologist. Later in life, he became the principal benefactor of the Canadian Geological Foundation. And for hundreds in Canada and around the world (mostly unknown by many of his associates in the geoscience community), Jerry was a renowned numismatist. Jerry Remick was born in Detroit, Michigan, on September 11, 1928. His family has a long and proud history in the United States, his forebear Christian Remich having emigrated from Luxembourg to Maine in 1651. This fact is proudly depicted on the reverse side of Jerry’s personal medal, showing the Remick family coat of arms and the inscription “Remich, Luxem-bourg to County York, Maine – 1651”. Successive generations of the Remick family made major contributions to the growth of their adopted country. Jerry’s grandfather, the original Jerome Hosmer Remick, was a famous music publisher and businessman in the late- 1800s – early-1900s Detroit. However, as we shall see, it was another family member, great- uncle-by-marriage Spencer Penrose, who would serve as a role model for Jerry as a supporter of geoscience. Jerry obtained his B.Sc. degree in geology from the Michigan College of Mining and Technology, Houghton, Michigan, in 1951, and his M.Sc. degree in geology from the same college in 1952. He also carried out graduate studies in geology and mineralogy at the University of Minnesota (1952 – 1953) and the University of Michigan (1953 – 1957). During this time he became a member of the Michigan Chapter of the Gamma Alpha Graduate Scientific Fraternity. Clearly, Jerry was committed to his chosen profession of geoscience. His first geological field work was with the Québec Department of Mines (now the Ministère des Ressources naturelles) beginning in the summer of 1952 and continuing each summer until he accepted a permanent position with the department in May of 1957. It was during the 1953 field season, as the various field parties assembled in St. Felicien, that Jerry met Ward Neale, then a party chief for the department in the Chibougamau area. The future president of the GAC invited Jerry along one evening for a drink in town, starting a friendship that would last a lifetime and include mutual devotion and service to the GAC. By 1955 Jerry was chief of his own field parties in Québec. In 1957 he emigrated to Canada to work full time with the Québec government. For the next 20 years he carried out field work, first doing regional geological mapping southwest of the town of Chibougamau, and later carrying out reconnaissance mapping using large helicopter-supported field parties in the James Bay area of northwestern Québec. One report from 1964 was entitled Géologie de la Région de Mannerelle-Joncas, published by the Ministère des Richesses naturelles, one René Lévesque minister. Jerry hung up his field boots in 1977 and became an information geologist in Direction de l’assistance à l’exploration minière of the Ministère. Here he was a tireless and gracious provider of geoscience data, developing a consulting room where all the information holdings of the Ministère were available for viewing. Jerry was always on hand to greet and assist visitors with all their information needs. 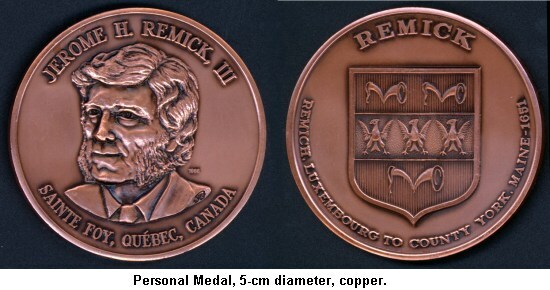 In fact, although he retired in 1995, his legacy was such that in 1998 the Québec Section of the Canadian Institute of Mining, Metallurgy and Petroleum awarded its Section Medal to Jerry for his role in facilitating easier communications between members of the mining industry and the research community. Since his retirement, I also learned from several of his former colleagues at the Ministere’s Géologie Québec that they much admired his work and person. Throughout his life, Jerry was devoted to the GAC. He joined the Association as a student in 1952 and was elected Fellow in 1955, thus becoming one of the few 50-year-plus members in Canada at the time of his passing. He told me once that very early on he resolved to financially support the GAC, just as his great-Uncle Spencer Penrose had done for the Geological Society of America. (He was quick to add that he didn’t have his Uncle Spence’s silver mines so his benefaction would have to be more modest!) By 1968, Jerry was volunteering for GAC’s Membership Committee (later Membership Review), becoming Committee Chairman for 14 years from 1970 to 1983. 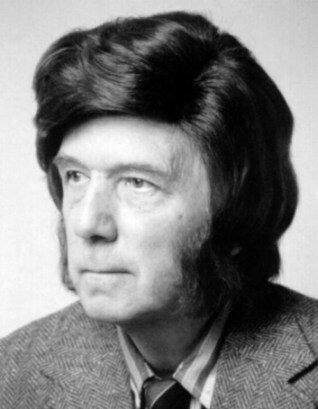 He received the GAC Service Award for his significant contribution in 1981. After stepping down as Chair, Jerry continued to serve as a committee member until 1991. His 24 years of dedicated committee work for the Association is a record that will likely be unsurpassed! Jerry was also a member and supporter of the Mineralogical Association of Canada. In 1955, at the request of one of the MAC founding members, he did the design for the MAC crest. 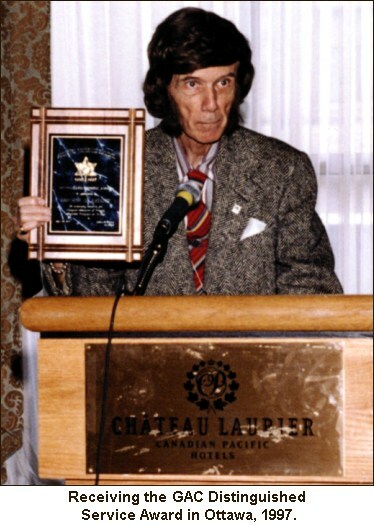 In recognition of this, MAC presented him with a plaque in 1998 prominently showing the Association’s bilingual (an essential requirement for Jerry) crest and the inscription: “In honor of one of our first members, Jérôme H. Remick, who provided the inspiration for the Association’s logo”. I also worked closely with Jerry when we were designing and adopting a crest for CGF in 1997. We exchanged numerous iterations, Jerry always reducing the size to ensure the elements would be legible on letterhead. His vast knowledge of coins and medals made him an invaluable advisor. Eventually CGF formally adopted a design that was one of Jerry’s favourites. Around 1990, Jerry decided to act on his long-held desire to financially support Canadian geoscience activities through the GAC. He approached GAC Executive and it was agreed that initially Jerry’s donations would go to the then-Logan Fund of the Canadian Geological Foundation. However, Jerry wanted something more formal established with both the GAC and the CGF. It was my privilege as GAC President to go to Québec City in 1993 and meet Jerry for the first time. We discussed his intentions and requirements over lunch, as I wrote our agreement on the back of the restaurant’s paper place mat. Later this became the basis for the formal Terms of Reference endorsed by GAC Council in 1994 for the GAC Jérôme H. Remick III Trust Fund, and by the CGF membership in 1994 for the CGF Jérôme H. Remick III Endowment Trust Fund. By this time, Jerry had donated something like $50,000 to the CGF. Jerry’s initial donation to the GAC Trust Fund in his name was for $10,000 in 1994. The primary purpose of the fund is to support the GAC Remick Poster Awards. Encouraging the better quality and greater use of posters at the GAC–MAC Annual Meeting was Jerry’s idea, and readily supported by Council. The poster awards were inaugurated at the annual meeting in Victoria in 1995 where cash prizes for 1st, 2nd and 3rd places of $250, $150 and $100 were presented. Along with the prizes, the winners received a corresponding GAC certificate suitable for framing that also bore an image of Jerry’s personal medal in either gold, silver or bronze. Today the prizes are worth $1000, $900 and $800 respectively, and they have had a positive impact on the quality of posters, as well as being much appreciated by the several student winners. The prize money comes from income earned by the GAC Remick Trust Fund, to which Jerry contributed $105,000 over the years. As a gesture of its appreciation, the GAC presented Jerry with its Distinguished Service Award in 1997 during the GAC–MAC annual meeting in Ottawa. A further $200,000 will soon be added to the fund as stipulated in Jerry’s Last Will and Testament. GAC will protect and invest the fund’s principal amount and support other educational activities besides posters with the extra annual income. His greatest benefaction, however, has been to the Canadian Geological Foundation. The Terms of Reference for grants made from the CGF Remick Endowment Trust Fund has a strong bias toward student activities and the public awareness of science, two topics of abiding interest to Jerry. Grants from the fund have supported numerous worthwhile and successful projects since 1994. The Remick Fund stood at more than $600,000 at the end of 2004, mostly through Jerry’s donations over the years. And he has named the CGF as the principal beneficiary of his estate in his Last Will and Testament. Most of this value is presently represented by his rare coin and medal collection, which will be auctioned off (as per his instructions) over the next year or so, and the proceeds remitted to his estate. This may result in a doubling or tripling of the CGF Fund in his name, ensuring a permanent legacy of support for worthwhile geoscience projects in Canada. If geology was Jerry’s love, then numismatics was his passion. He started collecting coins as a teenager in the 1940s, when one of his aunts gave him a Newfoundland coin. This grew into a life-long pursuit that resulted in a large and rare collection by the time of his retirement. But his interest was much more than just collecting. He was a founding member of the Canadian Numismatic Association (CNA) in 1950, and was a member of more than 70 numismatic clubs in 12 countries. He has had over 2000 articles on numismatics published in Canada, USA, England, Australia, Cyprus and elsewhere, and was author or co-author of several books on the subject. Perhaps he is best known for editing and co-authoring the impressive 576- page book entitled The Guide Book and Catalogue of the British Commonwealth Coins, which went to three editions. 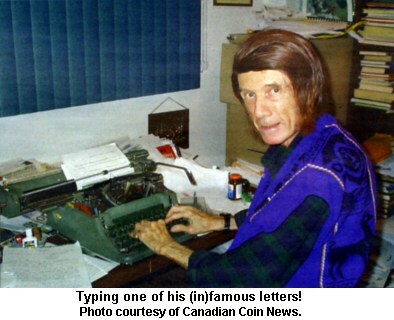 For his prodigious output and encyclopedic expertise, he received many national and international awards, including the CNA’s 2001 J. Douglas Ferguson Award, the Logan Medal of Canadian numismatics. Close friends of Jerry’s will also know of his tradition of striking personal medals, many of them Christmas medals, in three metals. 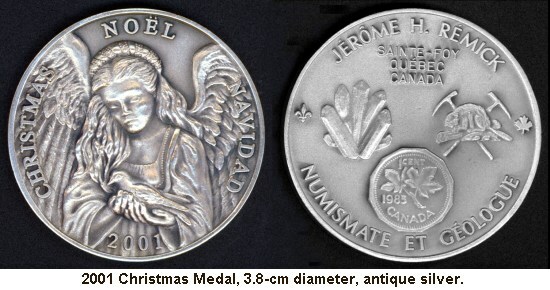 My favourite is the one for 2001 in antique silver, which has an angel holding the dove of peace on the obverse side, and as always, Jerry’s trademark symbols on the reverse with the inscription “Jérôme H. Rémick, Numismate et Géologue”. He explained to me once that the quartz crystals symbolized the geological side of his life, the penny his numismatic passion, and the beaver his adopted home. Jerry Remick was a wonderful man. After my initial visit to see Jerry in Québec City in 1993, I paid him a visit most years after becoming a member of the Canadian Geological Foundation in 1996. We would have dinner with a bottle (or two) of red wine at his favourite restaurant in Old Québec, and discuss the activities and investment portfolio of the Foundation, and many other things. Over the years, through these visits and innumerable letters (in his inimitable style on an old portable typewriter that required pervasive handwritten corrections! ), we developed a friendship that I greatly cherish. He was a hospitable, generous man with a profound love and intelligent regard for his science, profession and hobby. His friendship to me included kind support when my young sister died of cancer, providing the angel die from his 2001 Christmas medal, and advising me on design for the reverse side, as my family struck a commemorative medal for her. And I will always remember our sharing the shock and disbelief of 9/11 (Jerrry’s birthday) as we sat together in my hotel room in Québec City, watching the horror and devastation on television (it was our annual get-together and we were to go over business before having lunch). I again went to Québec City on March 8, 2005, to pay my respects to Jerry one last time. It was the day of his burial and it was my honour to represent the Geological Association of Canada and the Canadian Geological Foundation, and offer condolences to his family and friends on your behalf. At the funeral home, Jerry’s coffin was adorned with beautiful flowers and a mounted photograph – a picture of him proudly receiving the GAC Distinguished Service Award. It was a further honour to be invited to the graveside to say a few words in tribute to Jerry before his close friends, several of whom were members of his weekly Mahjong group. At the end of the ceremonies, one of his numismatic friends produced a bottle of Jerry’s favourite champagne, and we drank to a gentle man and a fine life. In one of Jerry’s letters to me he wrote, “I wish to return something to geology, so that others may benefit by our fascinating science”. Indeed! But it was a letter I received from his brother, Fenton, shortly after Jerry’s death, that best sums up the geologist and numismatist who became my friend: “He was a person of patience, wisdom, and infinite courtesy and kindness”. Amen to that.